Create a picturesque porch scene with the Amish Yellow Pine Royal English Swing Bed taking center stage. This beauty is sure to bring members of the family outside to enjoy some together time or some quiet solitude. This beaming beauty is pine outdoor furniture that invites you in as it creates a dazzling display. 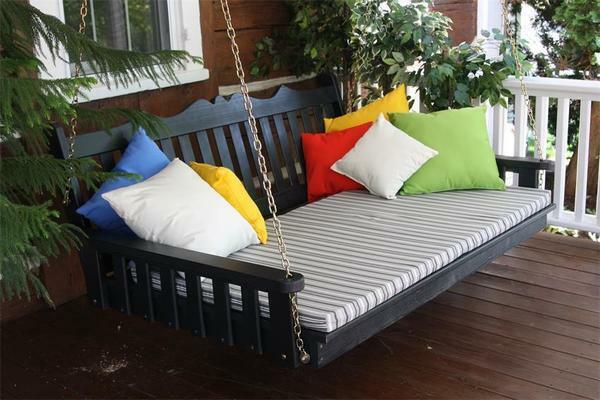 Replace some rockers with the hottest outdoor furniture selection going-the spacious swing bed! Handcrafted by the best in the business, our Amish woodworkers sculpt and shape untreated American grown knot free southern yellow pine wood to create a pretty picture. The swing bed back is elegant and inviting, while the generous arm rests allow you to lean in for a comfortable ride. We're excited to offer you options for this deluxe outdoor wood furniture. Choose the size and options and play with colorful accents to create the wood porch swing you're looking for. View more of our solid wood outdoor furniture from the Amish Garden Furniture Collection.If you have any questions about this magnificent Royal English Swing Bed, please give one of our Amish Furniture specialists a call at 1-866-272-6773. We would be happy to create your outdoor oasis!